Breweries celebrate their milestones in different ways. There are, of course, some commonalities in the industry. Breweries throw parties – because, duh, beer and parties. And they make special beers. Because, duh…beer. But where most breweries unveil some elaborate new beer with three hyphens and a barrel involved, Stone Brewing Co. has decided to spend their 20th anniversary truly looking back on their history; Stone is celebrating their longevity and hoppy ingenuity by revisiting some of their more ambitious and more popular anniversary beers since the Clinton years. What do those numbers mean? Nothing really. They’re just fun numbers that also show why it took a while to sample them all. My favorites were 02.02.02 Vertical Epic Ale, 14th Anniversary Emperial IPA and Bitter Chocolate Oatmeal Stout. But here are tasting notes for each beer in the series. Fizzy with a pillow head, this Belgian IPA merges coriander, banana, and clove with West Coast hops. Starting sweet, it transitions toward a fruity profile that bubbles out in a combination of everything described: banana, bitter but citrus-y hops, and a candied malt sugar. With one of those hyphenated-type names mentioned in the intro, this is a big and bold beer that delivers. The aromatics are nutty with a mildly toned chocolate and rich strong vanilla and toffee that drives the first impression without giving way to sweetness either. Given the inclusion of oats, the body was thinner than expected, but with that silky texture that sets a good imperial stout apart. This is a rich beer, with dark chocolate as the main bitter element before a chocolate milk-like finish. 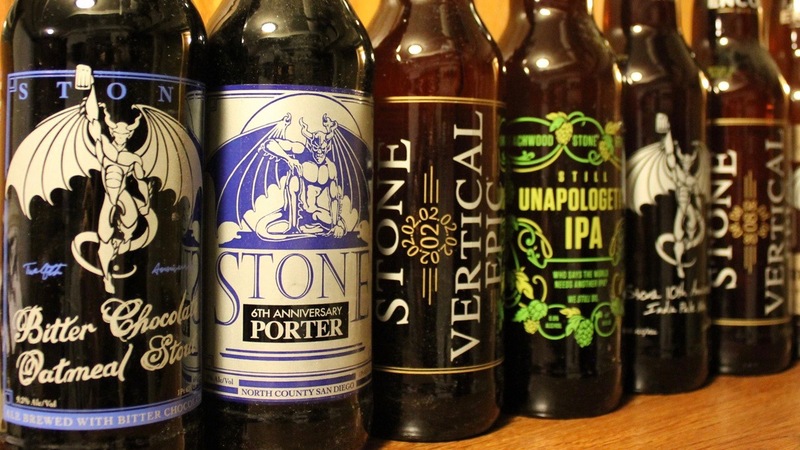 Not everything Stone brews is an IPA (but it might all be imperial or double). This tasty dark beer is black with a thick foam head that gives off a whiff of chocolate roasted barley and a trace of bitter coffee and sweet but subtle cherry. There’s an oak smokiness, but it has a soft mouthfeel that matches the head on its pour. While chocolate is the dominant flavor; it’s roasty and potent instead of dessert-y, with a classic Stone bitterness to finish it off clean. A straw-colored pour with pine notes and an earthy biscuit malt in the aroma, Still Unapologetic marks the evolution of the IPA style. It’s resinous and balanced, but also with complex layering of bitter orange peel, a medley of tropical fruits as it builds, and a bitterness at the back end that will linger until morning. It’s a palate wrecker and proud of it, still unapologetic after 14 years and into 21 years. Is the Belgian Strong the lowest ABV beer on the list? That random observation emphasizes the delicacy of this beer that’s traditionally crisp and refreshing, with some of Stone’s voodoo thrown into the kettle. It’s one of the most aromatic of the bunch: citrus, coriander, hay, and a hint of funk. While that’s a lot to describe, it goes down easy like a dry farmhouse ale with a bit of extra bittering hops at the end. It also bears the stamp of being one of Stone’s rarest bottles beers produced. Stone calls this one a “precursor to Ruination,” if that gives you the framework. Fifth Anniversary premiered in 2001 and explored everything Stone is known for today: citrus hops with a pine-puckering dryness at the back end. This beer wasn’t included in the taste test, but based on reviews, it’s floral and notably aromatic while the bitterness balances with a caramel malt build. Pouring a deeper golden-orange, this double IPA takes that familiar resinous finish but softens it with a floral, pineapple-mango and honey profile that’s easy on the tongue, and then blasts into a quick and bitter finish. While the 90 IBU is going to overpower the senses, it doesn’t burn the tongue, and the change of direction from soft to harshly bitter is incredibly unique. Escondidian reminds me of the early days of black IPA. Equal parts citrus, earthy and roast, it has an approachably smooth body while the aggressive hops redefine expectations shortly after the first sip. While the hops ultimately define this beer, it’s not as one dimensional as many of the Cascade Darks on the market in recent years. Sadly, this is another beer that was not sampled directly for this piece. The adventure of the Encore Series is picking out the flavors that have stuck around through the various trends. Naturally, then, Stone’s interpretation of an 1800s British IPA brings modern hop flavors to the front. A pineapple and papaya freshness hits first, but the British malt base is earthy and dry, countering the “all or nothing” aromatic approach of newer IPAs. It’s a winning combination. This finishes with that familiar pine bitterness but even at 100 IBU, it doesn’t feel like a palate wrecker.